Maurice Walsh Steel Fabrications are proud to announce we have attained the prestigious CE Mark for its product. Maurice Walsh Steel Fabrications is certified Execution Class 2 and have two certified Responsible Welding Coordinators at its factory , which is unique. The 'CE' certification demonstrates that the Maurice Walsh Steel Fabrications now have the requisite Factory Production Control system in place and fully operational. This verifies compliance with the detailed requirements of BS EN 1090:1 and BS EN 1090:2. Compliance with the requirements of CE Marking has become mandatory across the entire UK since July 2014. Conformité Européene ('CE' or 'European Community') was introduced in 1995 and CE Marking was created to stimulate the free circulation of goods within the European Community by removing barriers created by differing standards in member states. When applied to any product or equipment indicates that the manufacturer or its authorised EU representative has declared that the product of equipment complies with all applicable European Directives. 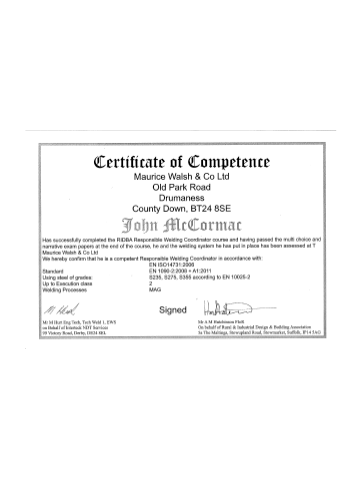 Certification became mandatory in the UK in July 2014, from which time it became illegal to sell structural steelwork in the UK or the Republic of Ireland that does not carry the CE Mark. CE Marking is not allowed unless the Factory Production Control (FPC) system under which they are produced has been assessed by a suitable certification body that has been approved to the European Commission. Maurice Walsh Steel Fabrications, which has been fabricating steel since 1972, demonstrated compliance with the new and more stringent European standards and was awarded the CE mark accreditation in July 2014.